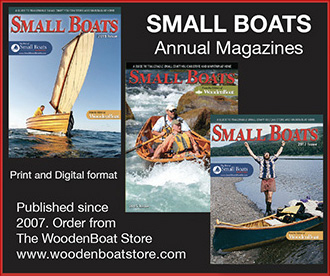 The Penobscot Wherry from Cottrell Boatbuilding of Searsport, Maine, is based on the Lincolnville salmon wherry, a beamy high-volume boat used to remove salmon from weirs in the days when there was a commercial salmon run on Maine’s Penobscot River. “Wherry” is a nebulous term generally used to describe a relatively light rowboat. 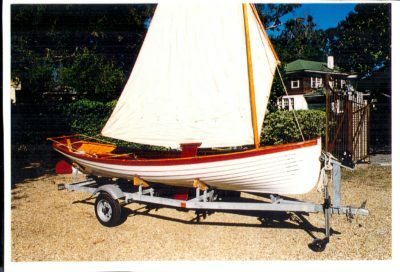 This particular wherry has a narrow, flat bottom with lapstrake sides, making it a specialized type of round-bottomed dory. The Golant Ketch is a 20′ hard-chined camp-cruiser designed by Roger Dongray. 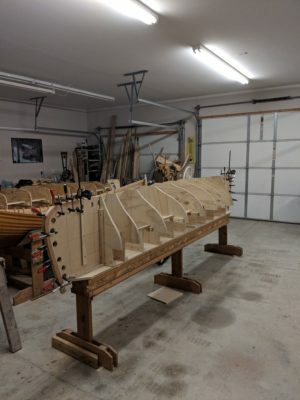 Dongray is perhaps best known for his Cornish Shrimper, which he designed in 1976 with the intention of building only one in plywood, for himself. 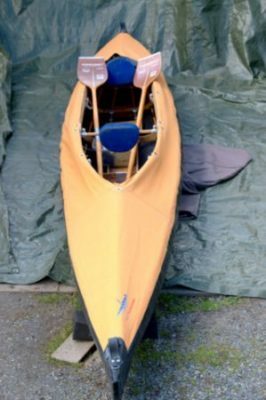 But after various friends showed an interest, 10 more plywood boats were built, and in 1979 Cornish Crabbers started building them in fiberglass and have now delivered 1,132 of them. At first glance the Ketch and the Shrimper seem to have similar hull shapes, but this is perhaps only because the eye is distracted by their wide-plank clinker-effect construction. I secured my gear on deck. 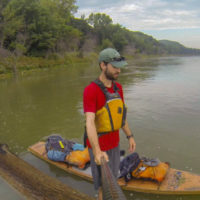 With my quick-dry pants rolled up and water shoes tied tight, I set a foot on the board, planted my paddle on deck for balance, and pulled my other foot out of the icy water and splashed it down on the deck pad. The water ahead was streaked with white. When a cowboy lingering outside the motel the night before said, “You know there are rapids on that river?” I’d brushed him off. Now I was fighting the urge to kneel on the board for balance. 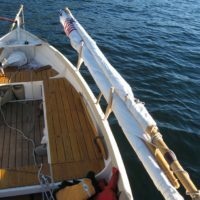 Oars, masts, and spars get you where you want to go in a small boat built for rowing and sailing, but those long sticks are awkward to stow when they’re not in use. I saw one interesting solution to the problem when I was kayaking the coast of Croatia. In the island village harbors there were lots of small fishing boats equipped with natural crooks set in the gunwales. Some crooks had more than one branch, providing two places to set spars or oars. Tom Santoro and has wife Carol had a cottage on Blind Lake, one of seven lakes on a chain of lakes in Michigan’s 11,000-acre Pinckney Recreation area, 60 miles west of Detroit. After Tom retired, they rebuilt the cottage as their year-round home. Tom had always enjoyed working with wood, and carved decoys, built wooden model ships and planes, and did simple furniture projects. 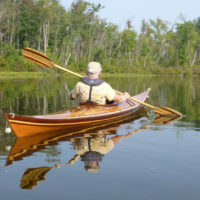 In 2006, his daughter Amy gave him a copy of Kayaks You Can Build: An Illustrated Guide to Plywood Construction, by Ted Moores and Greg Rössel. 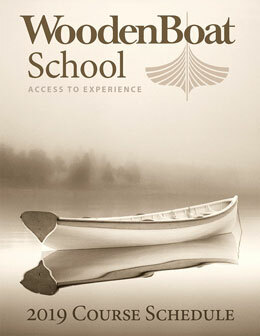 It piqued his interest in building something on a larger scale and that he could paddle on Blind Lake. If you want to hold a position comfortably in deep water, that’s what a sea anchor is for. It can also be really useful when reefing. When you're anchored out on a beautiful creek and your camera battery is weak and your phone is about to die, you’re out of luck. My solution is to bring power along in the form of a solar panel and a storage battery.